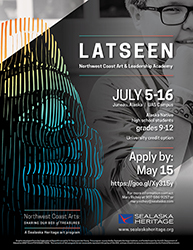 Applications are now available for Sealaska Heritage Institute’s Latseen Northwest Coast Art & Leadership Academy program. The academy for high school students will be held July 5-16 at the University of Alaska Southeast in Juneau. Travel scholarships are available to students outside Juneau. The training is designed to provide engaging culturally-based education and art activities for high school students in support of their future academic and personal success with a focus on rigor, relevance, and relationships. Students have the option of earning credit at the University of Alaska Southeast. This project is a part of SHI's Northwest Coast art project Sharing Our Box of Treasures. The project is funded in part by the U.S. Department of Education ANEP Grant PR# S356A170001.